Another day, another parcel from Aussie. I sound totally jaded there don’t I, like “oh man, another awesome parcel, daymnnnn I hate presents”. I’m not. I love presents. Especially cakey ones. This time, there was a slightly longer style in there, with an awesome flicky bit at the bottom. See? I’m still not sold on it. 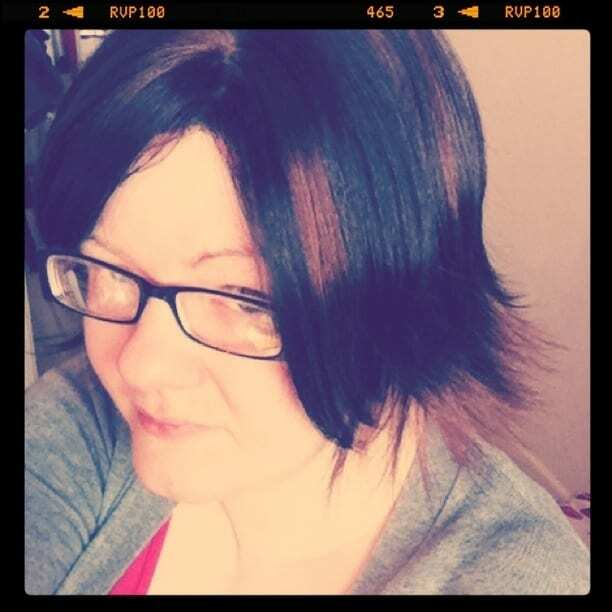 I kinda like the flicky out bit – its not so harsh as the bob I was sent the other week but its still too short for me. Seriously puzzled now on what to do with my hair – whilst its fading quite well now I’m using horrible shampoos (yes I know its bad for my hair, but I’ll do anything to get rid of the red!) I’m still not convinced on a dramatic cut. Help! I think it looks really nice. If you were to go for it, though, I think the brown highlight colour as an all-over colour would suit you. Have you tried that Colour B4 stuff to get rid of the red? I used it last week to get rid of far-too-dark permanent nearly-black and it worked very well indeed with no noticeable difference in condition. It does something to the molecules, apparently! It sounds really good, but I can’t afford it at the moment, while we have lots of horrible shampoo stashed away! I agree – the flicks are awesome, but I think you’re right – a bit longer, maybe with flicks at the shoulders would look amazing.